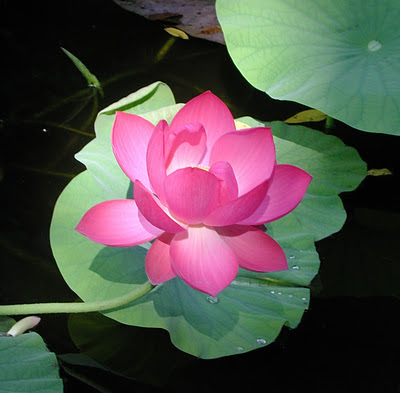 The Phytophactor: How do you explain a lotus? I wonder what provoked this post. The "it just is" appreciation of the world seems to effect all subjects equally from my experience and seems to stem more from intellectual laziness than any religious predispositions. Also, almost any art major will tell you that understanding the intricacies of the pieces parts of a tremendous work of art only serves to deepen the appreciation. The more you know, the more you can appreciate what is truly happening. Sometimes beauty is more than skin deep, yo. There's nothing about trying to understand a plant that rules out appreciating it for its surface beauty: you can do both at the same time. I shudder to think of what this person's kids must be like. The lotus in the photo is a funny-looking flower, alright. - For one thing, the light being reflected from it is completely diffuse. There's no specular reflections (no part of the plant is shiny), and there's no translucent parts, even though it's made up of thin structures. That weird feature may be related to the water-repellant properties of the plant, but it's unusual enough to be eye-catching. - The edges of the plant are perfectly smooth and even. In a lot of plants, they would be wavy, or a little asymmetric, or serrated. That's not too strange, and maybe the fact that humans like simple lines is a co-incidence. - The plant in the photo is also disease free. There are no little insect holes or discolored fungal spots. That is weird. Maybe the photographer searched long and hard to find a perfect lotus, maybe even gave it a little help in Photoshop, but if they all look like that, it's an unusual evolutionary tradeoff. All organisms protect themselves against parasites and attackers, but most settle on defending themselves about 90% of the time, because a 100% defense would be too expensive. Maybe we're seeing the plant in some lucky part of its evolutionary history, when a mutant happened upon a great new defense, and would-be parasites haven't adapted yet. Cultivated far from its native range provides an escape from its herbivores and diseases. This photo was taken a year before Japanese beetles arrived in the area, now unchewed leaves are rare.